Help me update and support the tool by donating with PayPal. “Set-ExecutionPolicy Unrestricted” must be set. The heart of the tool is a PowerShell script I created named invoke-XenBackup. The script does require the XenServer PowerShell module installed. The GUI Tool will do this automatically. To do this manually download the PowerShell module here under the development section. And extract it to your PowerShell Module folder. Can configure this script to backup vm’s only for last 2 weeks ? You could disable the script in your windows task scheduler after two weeks. When importing a backed up VM it is restored as a template, what in most cases is not wanted. This can be avoided by setting the following parameters, at line 133, before exporting the snapshot . Hello ,,,I am really new at this, do not even know how to write a script on any language, but I am really thankful I found this website. I have tried the backup tool on my server, I see the zip logs on the folder I want to send them to but I do not know where that actual snapshot went to . I do not see it under snapshots at the VM selected. Please excuse my ignorance. What am I not seeing or what am I doing wrong. Cool that you found the tool! The tool will copy the snapshot to the export path you selected after that it will delete the snapshot. You can send the logs to Chris.twiest@dtncomputers.nl. That way I can help some more. Hi Frank, you can download Version 2 of the tool today. Version 2 has fixed the temp issue which you experienced. I’ve been having issues when backing up my XenServer VMs. Your software issued to work fine but it stopped with no reason. I create a task with it but it does not run it and i don’t know where to find the logs. You can find the logs at “C:\ProgramData\Workspace-Guru\XenServer-Backup”. If you open the application and try a new backup with “Run Backup NOW” you will get the most info in the log. Does the software copy the VMs to local PC and then to the NAS (if using?). I noticed that the VM responsible for the backups loosing the storage space when the backup used to started. The software exports the snapshots (backups) to the backup path. This must be a local storage to the vm so it can be iscsi lun etc. It would be good to add the feature of exporting VMs directly to a network path. May this be NAS or any sort. Export to external drive could be a plus too. Your software is a very good, and free. It could even be used in a corporate place. Hi Davidson, thank you for your patience, Version 2 is out today and should solve your problems. I also added the ability to backup to network drives directly! But the user running the task must have writing writes to the share. I hope this works for you! Do you have an ETA of v2 of the software? happy to be on your beta list. I think around november. And I will keep you in mind! It’s finialy out today, sorry for the delays. Export-XenVm : There is not enough space on the disk. You can ignor the pool error. The backup fails because: Export-XenVm : There is not enough space on the disk. I don’t know why you won’t get a script in the folder did you schedule the task correctly with enough rights? Hi Parasant, you can download Version 2 of the tool today. Version 2 has fixed the temp issue which you experienced. Hi Prasamt, did you check your storage space. That was the issue in your last log? If you still have issue please email me the log to chris.twiest@dtncomputers.nl and we will continue through email. First off, thank you for doing all of the leg work in putting this together. I’m having a similar issue to Prasamt; I’m running out of disk space. In monitoring the process, it looks like I’m running out of drive space on my C:\ drive on the VM where the script is running. I’ve specified another drive (E: in this case) for the backup destination and for the logging. It seems as if the backup gets written to C: and then copied to E; small VM’s backup with no issue, whereas larger ones fail when C: runs out of space. Are there default locations that Citrix XenServer Powershell uses for temp or operating locations? Thank you for figuring that out! I will have to look in to that. I’m busy with v2 of the tool. Will take a look at this!! This forces PowerShell to use E:\TEMP as the temp location to copy the snapshot prior to writing to the location specified in your script. Using this location, I had ample free space to backup all of the VM’s in my pool. Awesome thank you for checking it out and I will do this in v2! I must be doing something wrong but not sure what. Could this also be because of the temp location? Thanks in advanced and thanks for creating this tool, its exactly what Xen Server is missing. Thanks for your reply, I’ll check that folder tonight! Version 2 is out today and has the temp issue fixed ! After one week of backup, my Xen’s local storage is full with vm’s snapshots but normally local must be deleted by the script. It’ s a bug or not. They should be deleted. Can you check out the log in C:\ProgramData\Workspace-Guru\XenServer-Backup and do you get a backup log? I’m having export problems I do not have logs to find out why. Hi Sully this is an error with the temp directory that gets full. I working on a new version which will fix this! Hi Sully, you can download Version 2 of the tool today. Version 2 has fixed the temp issue which you experienced. I’ve used the tool and it works (when I back-up a small VM/drive) but not for my normal VM’s because of the temp folder issue. I’ve used your tool so perhaps the Powershell module is allready installed? Or do I need to download the proper one from Citrix? Sorry for asking a simple question like this, its just I’m heading to a customer of mine tomorrow and would like to know if using your tool once is enough to install the module. That way I don’t need to wait for Citrix response so I can download the module. Thanks in advanced and can’t wait till version 2! I must be doing something wrong, I can’t figure out how to run without the tool. Sorry I don’t use PowerShell a lot but importing a module I’ve done before. Can anyone point me in the correct direction? That’s no problem, what you must do is first load in the function. The easiest way is to open Visual Studio Code or PowerShell ISE type in the first line import-module XenServerPSModule then paste the script above under it. And then beneath that start the invoke-xenbackup ! Your super fast with replying wauw! Would you mind if I send you an email so I can ask a few things in Dutch? I’m working on a live Xen Server and I’m a bit afraid I’ll mess it up with a script. You can always email me, no problem. appreciate any help you can give? It sound like the Installation of the SDK failed. Could confirm that it is installed properly? I also haven’t tested the tool on Win 7. Could you try Win10 or 2016/2012? 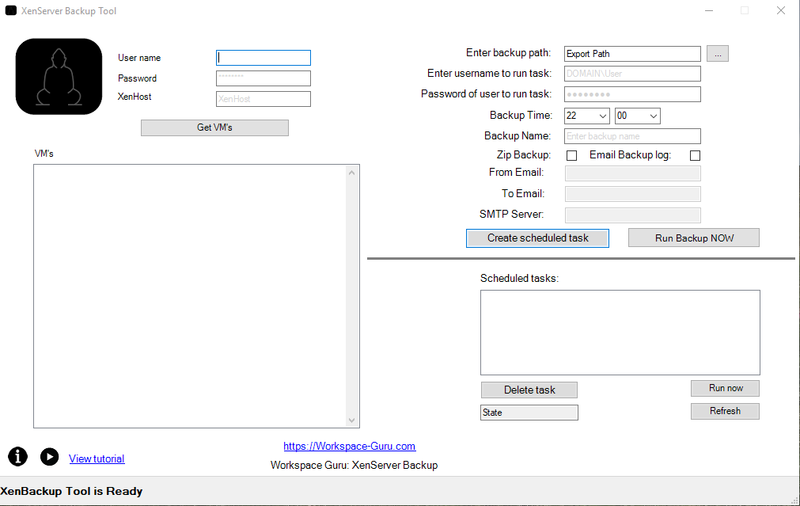 1) When I open GUI, connect to xenserver and select machine then I click “Run Backups Now” as mentioned in your tutorial. After clicking, GUI becomes hangs and goes to non responding state. 2) When I reopen it and did same procedure, after that” backup done” appears on GUI but folder remains empty. Nothing is created in that folder. There is no xva file. I will be much obliged for your help. Looking forward to hearing from you. The GUI is not hanging it’s just waiting for the job to finish. The second time you opened it, it was probably still running the export. New tool coming soon and will have the “hanging” fixed. Hi Syed, Version 2 of the tool is out and this fixes your issues. You can download the tool again and it should work. Unfortunately it does not work for me anymore . I probably have the same problem as “Syed Muhammad Hassan”. I selected a folder on D:\ and started the backup manually. I can see how the snapshot is taken on the XS and space on C: (which I have not selected) gets filled up. After some time the GUI responds but there is no Backup under D:\. I will release version 2 of the tool with the fixes this month. In the mean time the script above in the blog is already version 2 and can be used. But does require some PowerShell knowledge. Hi Kevin, Version 2 of the tool is out. This will fix your issues ! My job has been running for several hours for one machine with a 60GB disk. I noticed it was still running in task scheduler after 3+ hours. The logs says the following. I’m not sure what it’s pointing me to. It doesn’t look like this is part of the script generated. Please wait for version to be released later this month this will fix the issues or try using the PowerShell script in the blog. Hi Zack, Version 2 of the tool is out. This will fix your issues ! Whenever the backup runs, the export snapshot job always fail exporting to the drive I use. Ok can you see in the program data folder log why? please disregard, it does worked. it just so happen the test VM i am backing up was too large, that the back up and compress job takes to long. anyway thanks Chris, I am glad I found your site. To be honest I don’t know. If the XenServer Powershell sdk has support for xcp, then the tool should have to. You could try. because no valid module file was found in any module directory. Unable to find type [XenAPI.Failure]. So do i have to load any PowerShell SDK or something… Running the tool from Windows 2016 server..
Ah the folder has changed with thats why you get an error. I will fix it right away! Could you redownload and install the tool. The SDK installation should be fixed ! Ok is there enough space in c temp? And are there existing snapshots ? Can this script clean up old backups, or can you specify how many backups of each machine should be kept at a time? No not yet but it’s a good feature request ! I have an issue when the snapshots gets exported. The vm folders are created, but the files never gets there. Export-XenVm : Cannot convert ‘System.Object’ to the type ‘System.String’ required by parameter ‘Uuid’. Specified method is not supported. –> Cannot convert ‘System.Object’ to the type ‘System.Guid’ required by parameter ‘Uuid’. Specified method is not supported. Looks like there is an issue with the XenServer Powershell SDK module. Can you check if it is installed correctly? Sorry for the noobish question but in case of a server fail how do I restore all back up? Do I need to reinstall Xen Server and then recreate the VM’s from the snapshots ? Hi Enzo, you must reinstall XenServer and then you can import the backup in xencenter.